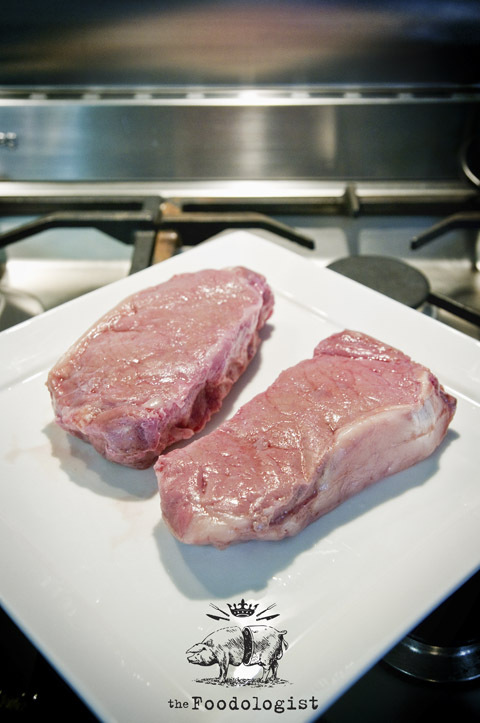 Sous Vide Steak – The Perfect Steak? �full bloodedness is the raison d��tre of steak; the degrees to which it is cooked are expressed not in calorific units but in images of blood�. Is this what Roland Barthe was thinking about when he wrote about steak? Now that summer is here (although what a summer we’ve had! ), I typically spend a lot of time cooking steak. I was taught by my father who owned and cooked in a number of successful BBQ restaurants in Adelaide how to cook steak and I have to say that I am a pretty dab hand now. If you take pride in it, as I do and especially when cooking steak for parents with high standards, it is a relatively finicky thing. I only turn the steak once (or if on the BBQ I turn it 45 degrees on the same side to get a cross hatch) and season when I turn. I use a searing hotplate and have learnt to cook my steak by feel. You can use the touch method, whereby you touch your thumb to your finger and feel the ‘padding’ below your thumb. So when you put your thumb to your index finger, the padding beneath your thumb feels like rare steak and when you put your thumb to your little finger, the padding below feels like well done steak. For medium-rare and medium, you use your middle and ring fingers respectively. This is actually a very good guide but it does mean that you must tend to your steak at all times and poke the meat until it feels cooked to the right ‘done-ness’. As part of the process of learning by doing, I have recently been experimenting with Sous Vide cooked steak. 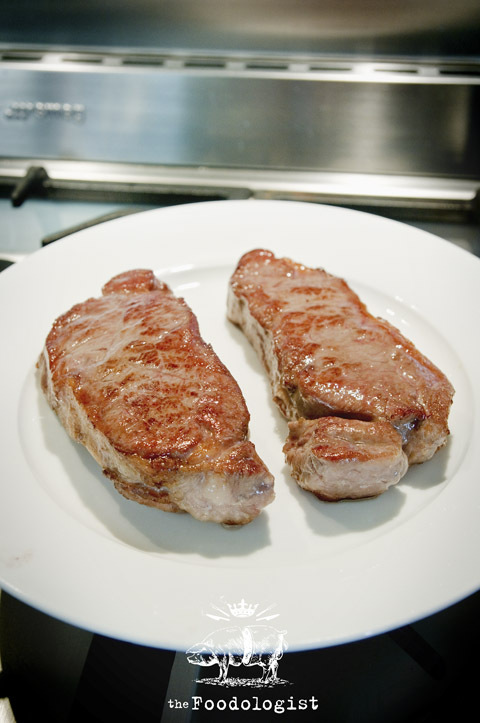 The benefits are that it is almost impossible to overcook your meat and you can do a number of serves at the same time and once done, they are cooked uniformly all the way through when compared to traditional methods which leave the core more raw and the edges well done and you merely ‘judge the average’. Once finished, the meat is then seared very quickly on a hot plate to create a nice brown and flavourful exterior whilst leaving the interior tender, juicy and cooked to your exact specification. To prepare the meat, the steak is placed in a cryovac bag and sealed. This puts the meat under vacuum and also serves to get rid of any air. This is widely used as a method of preservation as the lack of air and the presence of a vacuum serves to inhibit the growth of bacteria when storing meat in a chiller (i.e. between 0-4 degrees centigrade). I like my steak done medium. According to the literature, this is when the interior of the meat reached 55 degrees centigrade. 50 degrees is for rare meat and 70 degrees is well done. In this case, I set my immersion circulator to guess what….55 degrees centigrade. Immersion Circulator set to correct temp according to end result with the meat. Then as part of safety procedure and partly for the sake of technique, I use a thermocouple probe inserted into the core of the steak to measure core temperature throughout the cooking process. A rubber seal (the black square) ensures that no water (or air) enter the cryovac bag. 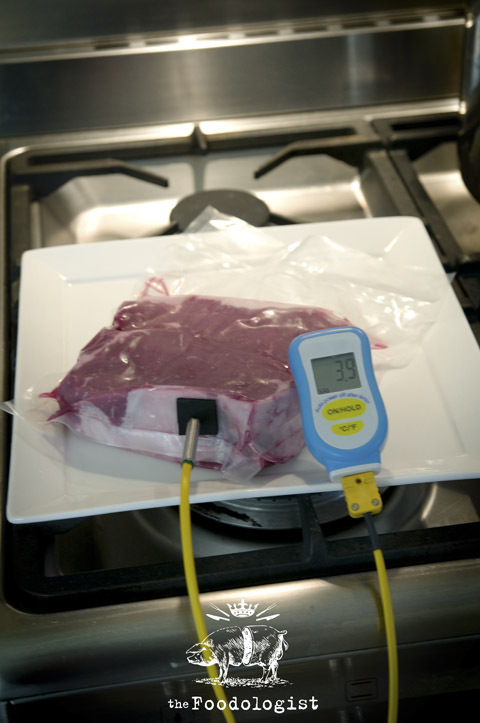 The picture below illustrates how both the temperature of the bath and the core temperature of the meat can be measured simultaneously. When the core temperature of the meat reaches my set temp, it is cooked to specification. Extra time spent in the bath will not affect how cooked the meat is although it will have a significant effect on the texture of the meat as the heat will serve to continuously break down the meat fibres in the same way that ‘slow and low’ cooking will tenderise even the toughest cuts of meat in a stew. In the case of steak though, a few extra minutes wont affect the final outcome. I pulled these steaks out at approximately 54.5 degrees centigrade. All in all, it took probably a bit over 1 hour to reach that temperature from my chilled temp of just under 4 degrees. Timing isn’t too much of an issue and I spent that hour quite wisely, playing with my 6 year old daughter. As you can see, the meat is cooked even on the exterior to a ‘medium’ consistency. 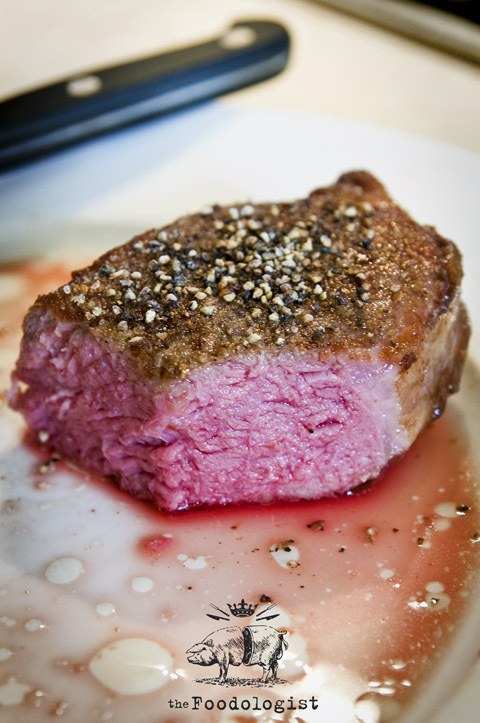 It is possible to eat this meat as is however one of the most pleasing parts of eating a steak is the encrusted exterior that result from frying. This is caused by a series of chemical reactions called maillaird reactions. All you really need to know about this however is that the browning on the outside caused by frying makes the meat more tasty and delicious!! Therefore, I fried it for around 30 seconds in a pan with hot oil. Because I was cooking a strip steak, I also browned the fat side to make the fat tasty and delicious as well. The end result is seen the the very first picture. Seasoned with salt and cracked black pepper, the steak has a nice brown exterior with an interior cooked uniformly all the way through to the edges. 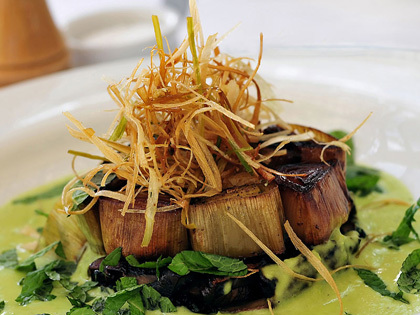 To eat, it was juicy, tender and overall a truly wonderful experience. I think you can get superb and similar results cooking via more traditional methods but cooking your steak sous vide at the very least will guarantee that it is exactly the same every time which is likely why so many chefs are using this technique in commercial kitchens not to mention the ability to cook a large number of portions with relatively little effort. Is it the perfect steak? A difficult question to answer. Cooking a steak on the BBQ outside with a beer in one hand is a form of enjoyment that I take VERY seriously. When done well, the results are also spectacular. 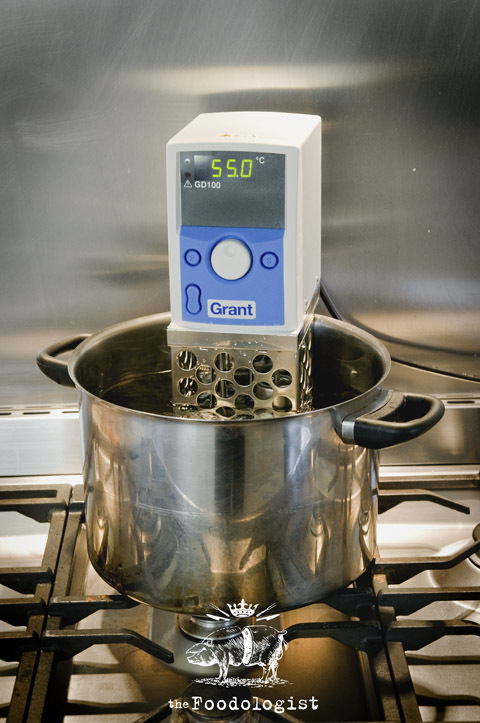 People have described sous vide and other more ‘modern’ techniques as ‘cooking by numbers’ and to some extent it is. However, the results of these methods result in consistency, quality and also simplicity. I think that I cant say with certainty that it is perfect, but I will tell that it’s pretty damn close! 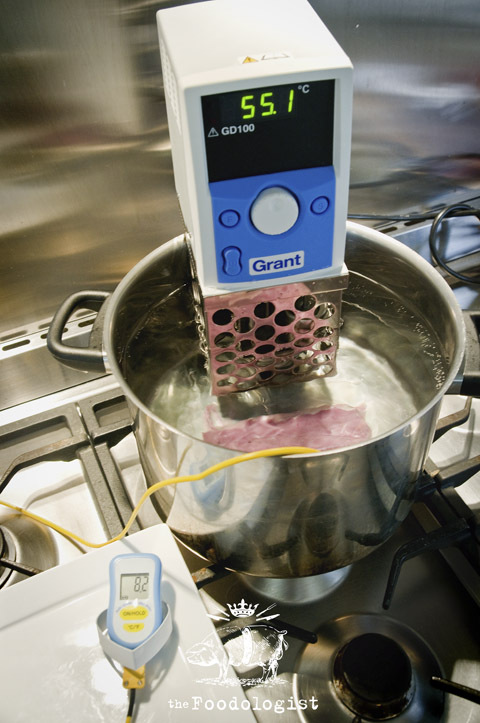 PLEASE NOTE: It is important to understand however that when cooking with relatively low temperatures such as those used in Sous Vide that critical care is taken to ensure that all ingredients are fresh and all cooking utensils are clean as there is potential food safety issues to take into account. There are a number of books available on the subject and if you are thinking of taking a foray into sous vide cooking, I would recommend reading them and researching the subject first. What a tempting piece of steak, George – gorgeous photo’s once again. Coincidentally I have just cooked a piece of fillet for a beef salad and am letting it stand now. I always use the thumb method – it is very reliable. Sarah at For the Love of Food recently posted..NYE 2011- Not 43 and windy after all! Ah, coincidentally I just posted on the same topic – I should’ve come here first and saved myself the trouble! That’s one fine looking steak! I have to say, that steak looks incredible. I also think that a medium steak is the best wayto have it cooked and very few places I’ve eaten out can cook it properly. where can I get the thermocouple? I got mine at Ecotel, where I bought the immersion circulator. Best of luck.